The International Olive Council attended the Conference of the Parties of the United Nations Framework Convention on Climate Change (COP22) to present research on sustainable olive oil production. Scientific studies have documented the positive effects of olive growing on the environment. In addition to the role played by the olive tree in safeguarding biodiversity, improving soil, and as a barrier to desertification, there is evidence that specific agricultural practices have the capacity to increase the atmospheric CO2 fixed in permanent vegetative structures (biomass) and in the soil. 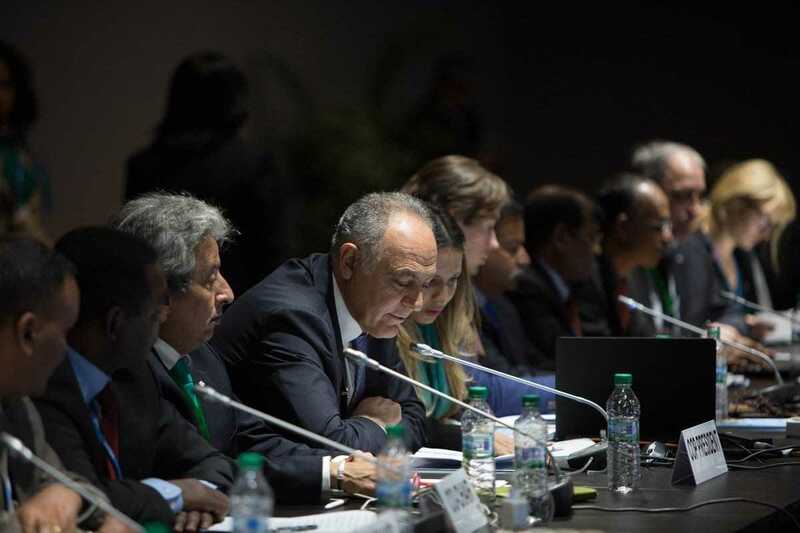 On this basis, the International Olive Council (IOC) was present at the annual climate conference COP22, (Conference of the Parties COP to the United Nations Framework Convention on Climate Change UNFCCC), which this year took place in Marrakech, Morocco, November 7-18 2016. In Marrakech, during a session entitled “Olive oil, the liquid gold helping to reduce greenhouse gas emissions,” the head of the environment R&D department of the IOC, Francesco Serafini, gave a speech about the role of olive trees and olive oil as a sustainable alternative to mitigate climate change. One of the IOC deputy directors participated alongside olive oil and CO2 experts to present results that indicate that the production of olive oil, using the right farming techniques, can contribute significantly to reducing greenhouse gas emissions. “In fact, according to the research published to date, during the life cycle of the product, an average 1.5 kg CO2e is emitted into the atmosphere to produce one liter of virgin or extra virgin olive oil,” said Serafini. “However, if the proper agricultural practices are applied, in a mature semi-intensive olive orchard with average crop yields, an olive tree can fix 10t CO2e/ha/year, resulting in a clear positive balance.” It can be therefore demonstrated that, when proper agricultural practices are applied, the carbon sink effect of olive trees is much greater than the amount of CO2 emitted to produce one product unit. In relation to climate change, a sink is any process, activity or mechanism that extracts greenhouse gasses from the atmosphere. These gasses include CO2, the concentration of which has increased exponentially in recent years and is the main cause of global warming. During the IOC conference, it was remarked that olive trees can be grown in extreme climactic conditions, where few other woody crops survive. Seventy percent of the world’s olive orchards are rain fed, without water from irrigation and using rainwater only. In some regions of the Mediterranean, olive trees are grown with barely 200 mm of rain and constitute an essential source of livelihood for many sectors of the population.